Longer days and warm weather has truly set in and it is a beautiful feeling, a great reason for dressing up! But if the feeling of ‘I have nothing pretty to wear’ or ‘I need that bikini bod before I can wear that outfit’ is worrying you then THIS is a post that has come to your rescue! We will be talking about a trend that’s not only figure flattering but equally easy to pull off for work, weekend drinks or a casual lunch date. 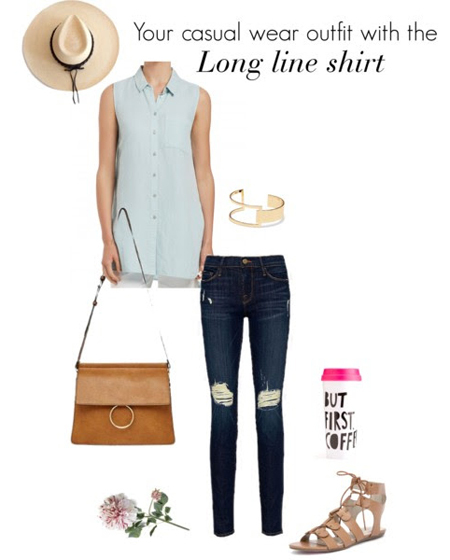 Let me show you 3 looks you can put together literally in minutes with the LONG LINE SHIRT! ‘Print perfection for work’ – A stunning abstract print is just perfect to break up the neutral tones that are more common in your work wear wardrobe. This long line tunic shirt is perfectly flattering in a body skimming shape and also covers the arms nicely. 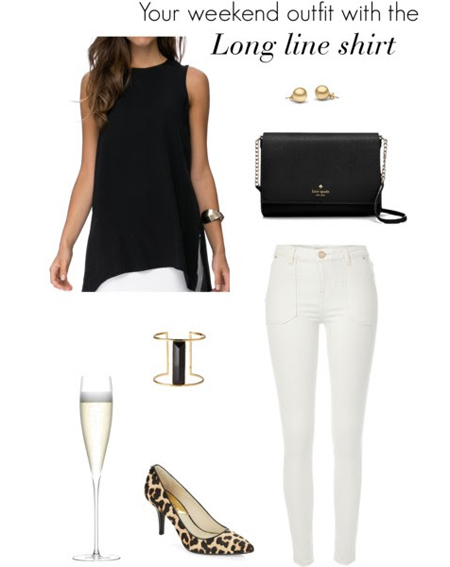 Teamed with a dainty rose gold necklace and a low wedge, it is your go-to work outfit that you will absolutely love to be in 9 – 5. 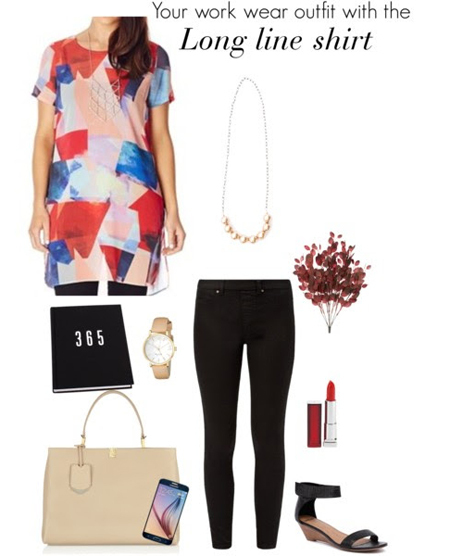 Throw in a bright lippie and a stunning structured leather bag to finish in absolute style! ‘Relaxed on trend‘ -A collared long line shirt will be your answer to ‘how to look awesome even in a super relaxed outfit’. A cool blue colour with a darker wash distressed denim along with complimentary tan lace up sandals and a tan bag will make you look absolutely cool and trendy. Don’t you just love this ‘Chloe’ inspired bag? Make sure you wear your broad rimmed straw hat for sun protection and adding the cool quotient to your look. Shop similar pieces at - Long line shirt – Sussan , Jeans (similar)- David Jones, Bag- Witchery, Sandals – Styletread , Bracelet (similar) – Sussan.